Return To Maplewood by Elizabeth Bromke is a delightful contemporary novel that continues the story of the Maplewood sisters, this time focusing on Anna. Past hurts intrude on the present. A partying lifestyle and outlook are designed to protect hearts – but it is an empty and potentially dangerous way of life. Turning ones back on the party scene is not always a popular decision but it will bring freedom. There is the theme of loss. We can never replace those who have gone before but life must continue, especially when children depend on you. A delightful four year old charms not only the characters but the reader too. Home is wherever your family is. Doing your own thing may feel like freedom but it is a lonely existence. The warmth that radiates from the heart of the novel encompasses the reader as well as the characters. 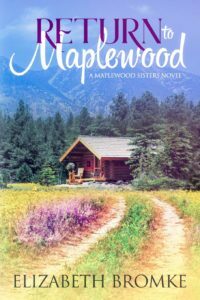 I am loving this Maplewood series. It is very warm and wholesome and delights my heart and soul. I cannot wait to read more.